The classic tale reawakens and expands through the first-person perspective of Snow herself in this comic retelling! The tale of Disney Snow White and the Seven Dwarfs is told through the perspective of the princess herself! More than a damsel in distress, she possesses a heart and soul that yearns for knowledge, love, and acceptance. Made to work in her own castle by her wicked stepmother, the Queen, Snow’s world changes the day she meets her prince charming and her jealous stepmother tries to have her killed. Snow flees to the forest to hide and finds sanctuary with a family she never could have expected in the boisterous seven dwarfs. Can her heart still flourish with the shadow of the queen’s hate looming over her, and only the lingering hope of seeing her prince again? 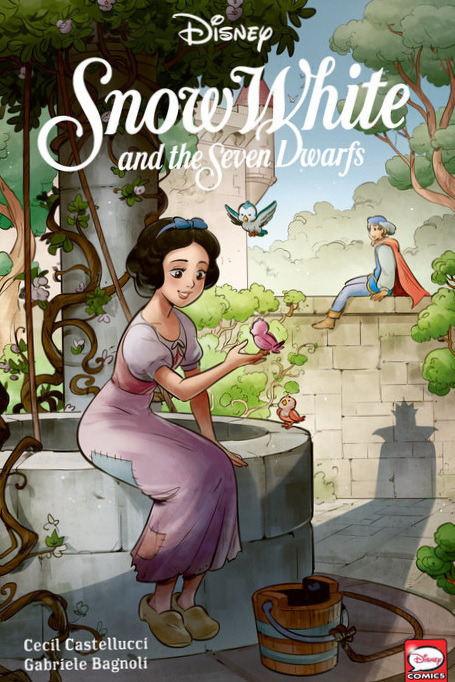 Written by award-winning author Cecil Castellucci (Soupy Leaves Home, Shade, The Changing Girl), this graphic novel revives the timeless classic of Snow White for audiences young and adult. Glimpse into the mind and heart of Snow White as she experiences love, betrayal, terror, hope, friendship, longing, and sadness, before her happily ever after. Collects Disney Snow White and the Seven Dwarfs #1-#3.